Times have changed – not because there is more democracy in the US but because the capitalist class feels more secure. The Republican debate saw almost one and a half dozen candidates on stage in two sessions. 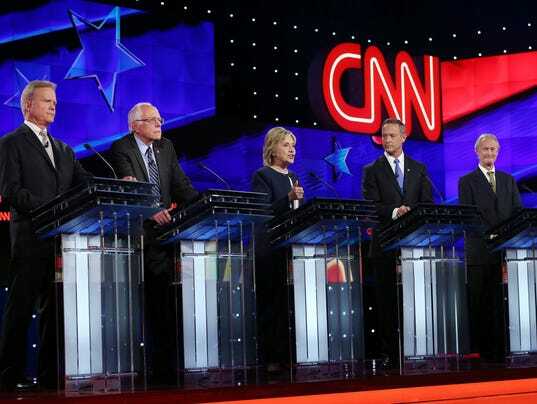 The Democratic presidential debate this week had five candidates on stage. Of course, Hillary Clinton was there too. Many commentators and pundits declared her the winner in the debate! The CNN’s own poll showed people overwhelmingly chose Bernie Sanders as the winner. Sanders defended Hillary when the CNN’s questioner Anderson Cooper asked about Hillary’s use of private email server while she was Secretary of State. One simple reason can be that Sanders didn’t want the debate time to be wasted on email issue and instead wanted it to focus on major issues. Another reason, possibly, is that Sanders has doubts about winning the Democratic nomination and is thinking of joining Clinton cabinet in some capacity. Now about Hillary winning the debate. Yes, she is the winner for the Democratic Party elites who had doubts about her. She has ruined Vice President Joe Biden’s chances for running as a presidential candidate before even his entry. Just released ad about Biden by his supporters was of course, for Biden, a testing of people’s and Party stalwarts’ mood. This coming from a person who had been on the board of directors of Wal-Mart! However, her mouth remained shut when Wal-Mart was waging big campaign against trade unions. Of course, it’s always easy for the World’s Cop to tame others but almost always impossible to rein in its corporate rogues. Up until this point in time, warmonger Hillary’s chances of becoming the next US president, and for that matter, the first woman president, are bright. Yes, the news media, particularly the Fox TV, and the Republicans will try to do their best to go after the private email server issue, but it seems Hillary and her husband Bill will, most probably, overcome this hurdle. Unfortunately, her victory, if she wins, will lead the United States into more wars and more disasters. This entry was posted on Friday, October 16th, 2015 at 00:04	and is filed under Uncategorized. You can follow any responses to this entry through the RSS 2.0 feed. Both comments and pings are currently closed.